Are you feeling all holly jolly? We're totally in the spirit around here, despite the fact that we don't have our tree up yet. We've had a few health setbacks (hello, colds and oral surgery!) and plus our tree is incredibly fake and the storage unit is a pain to get to. But that will change tonight, when we unwrap that sucker and get it all set up. Of course, trees are great and all, but the one thing that really makes a home feel ready for the holidays is baking. There's nothing like our little apartment smelling like spices and sugar, and a counter full of special baking to grab and nibble on. These cookies are inspired by Oreos and shortbread, combining the two into a little holiday cheer. 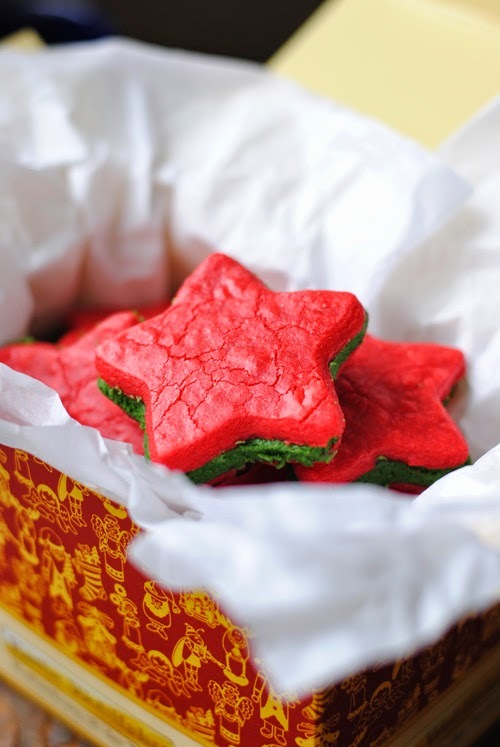 Creamy butter icing sandwiched between bright red shortbread stars -- perfect for Santa or a cookie exchange. What will you be leaving for Santa this year? In the bowl of a stand mixer, combine the butter and sugar until smooth. Add the vanilla and food colouring, mixing and adjusting the dye until desired colour is reached. Add in remaining ingredients and mix until well combined. Separate the dough into two halves, and form into small discs. Cover with plastic wrap and refrigerate for 30 minutes (I sometimes pop it into the freezer for 15 instead). When ready to bake, preheat the oven to 325F and line two baking trays (or one, whatever) with parchment or a baking mat. Set aside. Sprinkle a clean work surface with icing sugar or flour, and roll out the dough -- about 1/4 inch thick (1/2 centimetre). 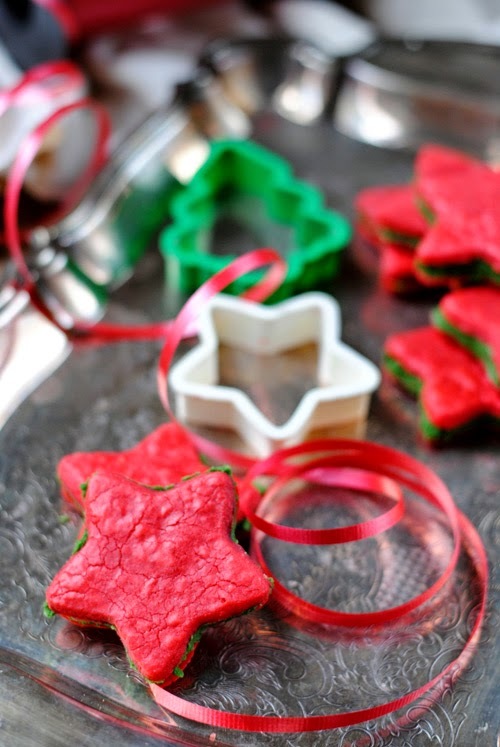 Cut out shapes with a cookie cutter, and place on the baking sheets. Bake for 10-15 minutes, until the edges are set and the cookies are slightly firm (but not too brown! They'll be ugly). Allow to cool on the pan for a few minutes, then remove to a wire rack. While the cookies are cooling, make the icing. Combine the butter and half the icing sugar in the bowl of a stand mixer and beat until smooth. Add a few drops of green food colouring, and mix in. Adjust until desired coloured is reached. Beat in the remaining icing sugar to taste and texture desired. You'll want it to be rather soft so it's easy to spread. 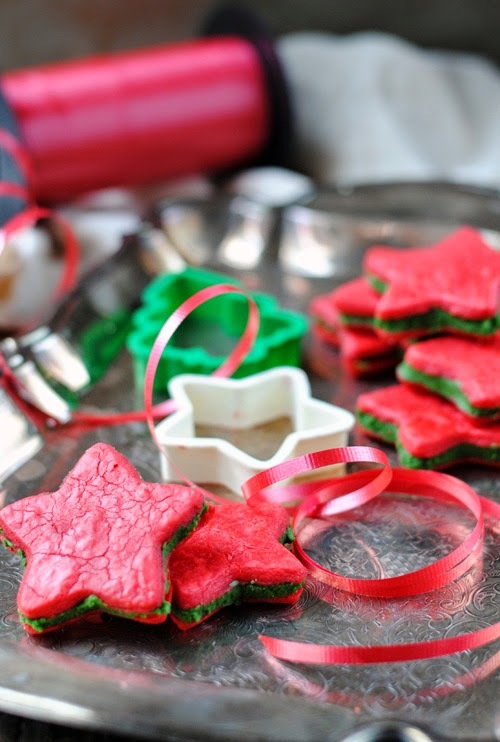 To fill, simply pipe or spoon the icing on the ugly pan side of one cookie, then place another on top. Voila! You're ready to feed Santa.